Dont Miss The American Rancher April 29th! It takes courage to grow your business; to make changes, to make progress. It also takes courage to get back in the saddle once you’ve been bucked off. But what if you weren’t really bucked off, but rather thrown from your pickup as an 18-year-old with your entire life in front of you. You’re in Wyoming, look down at your map, and after your truck stops rolling, you are setting in the ditch, next to the fence post you were thrown into that broke your back. You can’t feel your legs, and when other drivers stop to offer help you ask to borrow a phone to call your dad. 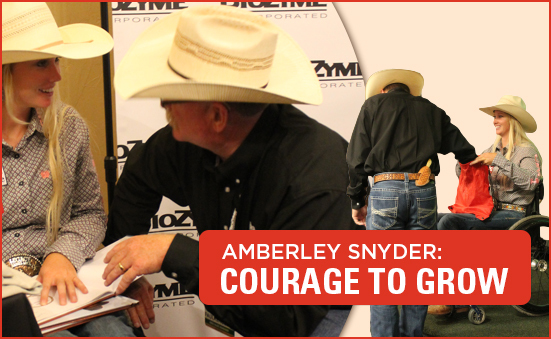 That is just the beginning of a true story of courage, and the real-life account of Amberley Snyder, this year’s keynote speaker at the BioZyme Dealer Retreat. Amberley retold of that fateful January day in 2010 when her life was literally turned upside down. The Utah State FFA officer had big plans to attend college in Oklahoma on a rodeo scholarship. She’d been a barrel racer since a very young age, and she and her horses always had a special bond. Then, she heard the words that she’d never walk again. As in a successful business, drive, courage and goals kept Amberley focused. Her first three goals: walk, ride, rodeo. In just 18 months after that fateful day, she was back on her horse. She has successfully competed at rodeos and she is still determined with the grace of God, continued therapy and modern medicine she will walk again someday. Amberley shared 5 important lessons with the dealers at Dealer Retreat that can be applied to both life and business. “We don’t always get to choose what we draw out of the bag, but we do get to choose how we handle what we draw,” Amberley told the crowd as she asked three volunteers to come on stage with her and “draw” from a bag she had with her. One rugged dealer from Wyoming drew a silky, pink scarf and modeled that accessory like he sold scarves instead of VitaFerm for a living. Another drew a wooden chicken and strutted like a chicken; the third drew out a sweet Snickers candy bar and took a big bite out of it. Perhaps if each had drawn the different object out, they would have handled things differently. But life is about making the right choices for us and our businesses. “Don’t be afraid to ask for help or accept help.” We all are better when we accept the help from those who offer it. If we can’t do something or don’t know the answer, asking doesn’t mean defeat, it just means you want to be better. “Don’t compare your challenges or accomplishments to someone else’s.” It’s easy to fall into the comparison trap. But don’t. Think you’re having a bad day? Someone else is likely having a worse day. Everyone is fighting some kind of battle. Did you just make the biggest sale ever? Good for you! Celebrate, but stay humble. “Attitude is a little thing that makes a big difference.” Amberley knew her attitude would help determine if she would ride or rodeo again. Having a positive attitude in a negative situation made all the difference. The same can be said in business and offering the best customer service. You can have the best products on the market, but if you have a poor attitude, you probably won’t see customers lined up at your door. “There is no future in giving up.” If you are reading this newsletter, you likely aren’t a quitter. Neither is Amberley, the only paralyzed barrel racer and break away roper on the professional circuit. Are your sales not quite what you expected this month? Have the courage to make a change. Get out and meet some new potential customers. Support the local fair. Whatever you do, never, ever give up. Adolescence can be a scary time in a young person’s life. High school is busy with homework, FFA and cheerleading. Serving as the Northeast Kansas FFA Vice-president, Kansas Angus Association Ambassador, working cattle with family and going to shows takes up a lot of time. Those activities might seem like enough to keep a junior in high school busy, but add in a BioZyme® dealership, and you’ve got the life of 16-year-old Eva Hinrichsen of R&L Feeds near Westmoreland, Kan.
Eva, whose parents, Ron and Lynne, have been BioZyme dealers for nearly five years, decided she would like to take over the dealership and make it her FFA SAE (Supervised Agriculture Experience). She had total support from both her parents and her FFA advisor. While it was slightly daunting for her at first, Eva said the positives definitely outweigh the bad. She has honed in on her sales skills and increased her product knowledge, which was the biggest challenge she faced. Eva has set goals for both R&L Feeds and her SAE. For her business, she wants to increase the total tonnage she sells on annual basis and expand her product line. For her SAE, she wants the project to be successful and show some revenue. She said there is a lot of records to keep with both. Initially nervous, Eva says she now talks to producers with ease, and that they have been pretty friendly. 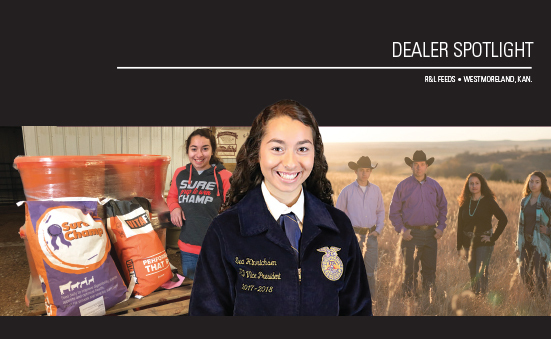 She takes advantage of the weekends and evenings to do most of her work for the dealership, and makes contact with a lot of her customers at the cattle shows she and her family compete at on weekends. One of her highlights so far, has been attending a new dealer orientation. “Getting the knowledge has been beneficial to me owning cattle myself. I went to Saint Joe and went to a class with other dealers, and I learned about the Amaferm® advantage and how that can increase the digestibility, and how gut health increases immunity. All that helps increase genetic potential. So that has been helpful for me when developing my own feed rations,” she said. Eva encourages others who are interested in starting a business or becoming a dealer to find the courage to do so. Competition is not a bad thing. 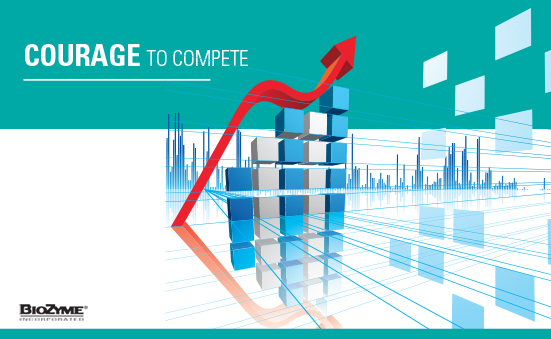 In fact, competition is important to the overall growth of your business and has the potential to impact your bottom line. 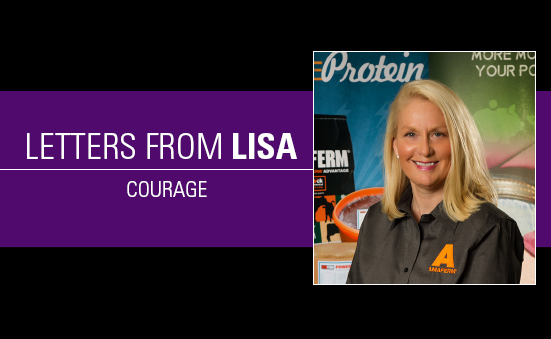 As more competition surfaces, it is important to tell everyone why they should buy their animal nutrition products from you, and to have the courage to set yourself apart from others in the business. product best fits the season. It’s one thing to sell an outstanding product. But how does your customer service stack up again the competition? Outstanding service will go a long way. Do you live in an area where there are “hobby” farmers who work a 9-5 job? Stay open late so they can pick up their products after work. Delivery is a big service that many offer, but making sure that the product is delivered on time to the proper place is important. Even though you think you are in the feed business, livestock business, equine business, nutrition business, the number one business that everyone is in is the “people” business. Building a relationship with your customers shows that you are genuinely interested in them and their program. Often business relationships evolve to friendships that evolve into long-standing customers. Know what products your customers need and when they will need them. It is ok to “toot your own horn.” You’ve got a good product, so let others know about it. This might be on your social media channels, a sign along the road or even at the local auction barn. Get out and spread the word, and encourage your customers to tell their neighbors if they like the products too. Positive peer reviews are a positive marketing tool. The fact you have competition should motivate you to be a better business person. You will need to be highly motivated to remain the better business owner. Be proactive, alert, creative and above all focused. Always think of better ways to satisfy your customers. Staying competitive in the marketplace does take a certain amount of courage. But if you remain innovative, build relationships and provide outstanding customer service, you will edge out the competition. Does it ever seem like your to-do list grows by the day and you never get to check anything off of it? Are you working longer days and not feeling like you get to spend as much quality time with your family and friends? As your business grows (and that’s a good thing), so do your responsibilities. But how are you ever supposed to get everything done? so you need to do this the first thing every day or every week and get the tough tasks out of the way. What is your time worth? The adage, “time is money” is true, and if you ho hum around avoiding the tough tasks on your to-do list, you are losing time and potentially losing profit. By facing the toughest tasks first, you have the opportunity for further growth. Maybe you have been working with a potential customer for months, and if you contact them early in the day and make a sale, you are already growing your business first thing. Have an employee that isn’t meeting expectations? 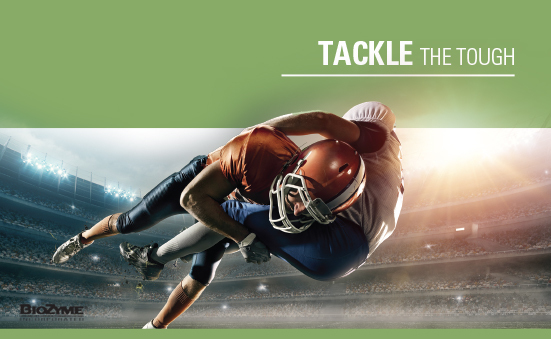 Tackle that issue first thing in the morning to start improving productivity. When we have the courage to face the toughest tasks or the jobs we are dreading, we get those out of the way, and the rest of our day, can only improve. And what if something good comes out of that sales call you’ve been dreading to make? Then you are starting your day on a high note, after you’ve checked that task from the to-do list. On Inc.com, Jeff Haden suggests choosing the 2-3 most important tasks (MIT) to tackle each day. As you make your daily to-do list, put these MIT at the top of the list with a goal to have them accomplished by noon each day. That gives you time for other tasks that need be accomplished. It is human nature to avoid the tough times. But if you focus on the tough tasks in your job first, you will notice increased productivity, the potential for more financial growth and days that will fly by more quickly. It feels pretty good to have a loyal customer base that you’ve built relationships with while growing your business. You know their needs, and they have learned to rely on you to have the products they need when they need them. However, you can’t continue to grow your business if you aren’t constantly seeking out new customers and leads. It isn’t always comfortable to make that first call, but seeking out new customers is imperative to continue growing your business. Surely not every livestock owner, cattle feeder, horse and dog owner in your sales area is familiar and using BioZyme® products, and if they are, kudos to you! So, find those who are not using the products and reach out to them. Not sure the best way to find those prospects? Here are a few simple suggestions from Inc.com to find new customers. Cold-calling. This involves reaching out to someone you’ve probably never talked to before and know very little about. Perhaps you scour the ads in the local shopper paper each week for people who are selling livestock. If you see someone in your area who isn’t a customer, they automatically become a potential customer. Chances are if they aren’t a customer, the reason is because no one has ever asked them before. Networking. There are several opportunities for networking in the agricultural business world. Perhaps you have a booth at a local cattlemen’s meeting or extension field day. You might even attend the weekly sales at the local livestock auction barn or the county fair to visit with people that you know are not current customers. Ask for referrals. Ask your satisfied customers to send their friends and customers your way. Perhaps you can work out a deal to get a buyer’s list from a seedstock producer who hosts an annual sale. Peer reviews go a long way, and especially if other producers see positive results, they are going to want to get similar results with their livestock. Affiliate marketing. Partner with a non-competing ag company like a bull stud or fencing company to share contact names to get the maximum exposure. Perhaps its as simple as inviting their customer list to an open house or producer meeting. Listen, listen, listen. 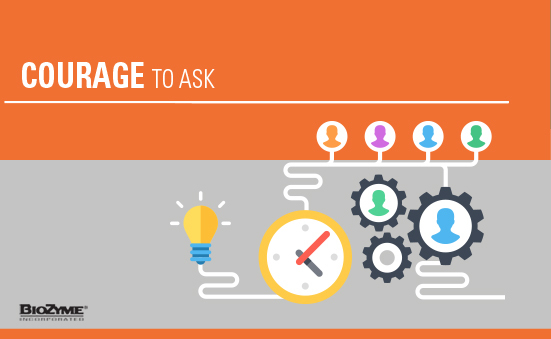 Ask open-ended questions and let the prospect talk. If you ask the right questions and listen more than you talk, you will learn a lot about the prospect. The prospect will feel like you care, and that you are sharing genuine interest in his or her operation. Do not go into a call with a predetermined sales route you want to follow. If you think you are going to sell tons of one product without even knowing the needs of the prospect, you will likely have deflated goals. Once you know what the needs are of the prospect, you can start recommending products that best fit his or her needs. Follow up is very important. Wadle says it is important to follow up with the prospects to show that you care about them and their needs, and the sooner the better. Don’t put off follow-up. Perhaps before you leave the initial call ask when a good time is to reach back out to them to answer any questions they might have thought of. Finding new customers is all about building relationships. Relationships start with simple questions, showing you care about a person, their animals and their bottom line. Expand your relationships, and watch your customer base grow. Christmas is my favorite time of year. The birth of Christ and its meaning has been a monumental part of my life, and my birthday is December 24 – that is a story of courage in itself. 1. God gives courage to ordinary people. 2. God gives us courage to overcome our doubts and fears. 3. God gives us courage to face the future. God provides the same courage to business leaders, but we try to complicate it by making rash, unproductive or irrational decisions. The word ‘courage’ derives from the Latin word cor, which means ‘the heart.’ Courage originally meant “To speak one’s mind by revealing all one’s heart,”in other words, to speak openly and to act honestly with integrity. It means to tell your story how it is – even at the risk of being rejected, ridiculed or misunderstood. Do you have this type of courage in your business? The good news about courage in business is that it is not something you either have or don’t have. Courage can be learned, cultivated and practiced. Six processes can help you start down this path: setting goals; determining the importance of achieving them; tipping the power balance in your favor to precipitate action; weighing costs against benefits and moving forward with that balance in mind; selecting the proper time line for action and developing backup plans. Changing our lives, and eventually creating an entire culture of courage, starts with small acts which then produce micro-changes in each of these processes. As we enter into the Christmas season, do you need the courage of Joseph to boost your business? Joseph took what he perceived at the time to be small steps, but those courageous steps made our world and our lives a better place.